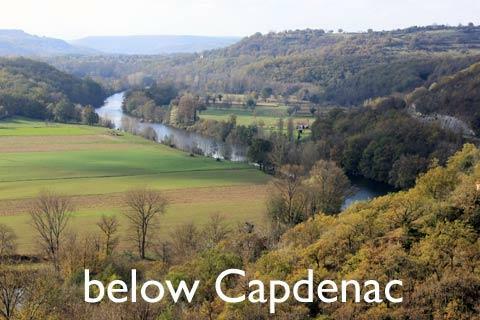 The Lower Lot Valley here refers to the picturesque stretch of the Lot River between Figeac and Cahors. Along the course of the river there are numerous small villages to explore, several larger towns, castles and caves to visit. There is also a great deal of beautiful scenery, with cliffs and wooded slopes rising either side of the broad river valley.The river here is passing through the Natural Regional Parc of the Causses de Quercy. 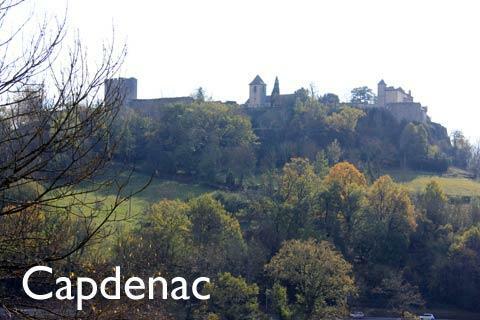 South of Figeac you should first visit Capdenac, a very lovely and very ancient village that still retains a great deal of medieval charm and has lovely views across the Lot Valley. To the east of here you could also visit Faycelles in a scenic position set along the top of a cliff. Continuing westwards you soon reach Saint-Pierre-Toirac, a small village with a picturesque 12th century church, then on to Larroque-Toirac, well known for its castle. The castle of Larroque-Toirac was built in the medieval period against the side of a cliff and is still in very good condition, while inside it is perhaps the fireplaces and frescoes that are the most impressive features. From here you can cross the river and continue on the main road, but is is perhaps more interesting to stay on the smaller road along the northern banks of the Lot as we have done here. 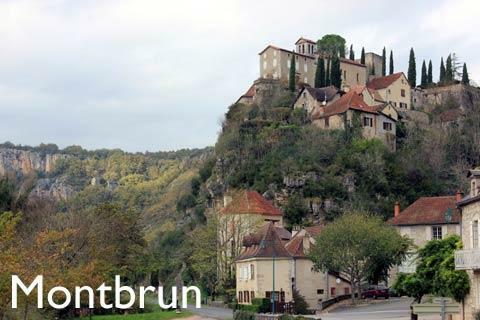 You soon reach Montbrun, a small village with a church and medieval tower poised high on a cliff above the road, before contiuing on to the small town of Cajarc. Cajarc has a small historical centre that is very worth exploring. Beyond Carjac and still following the Lot River Valley you reach two more small villages. Larnagol is best known for its fortified castle, while in La Toulzanie you can see a whole street of houses built right into an overhanging section of cliff. 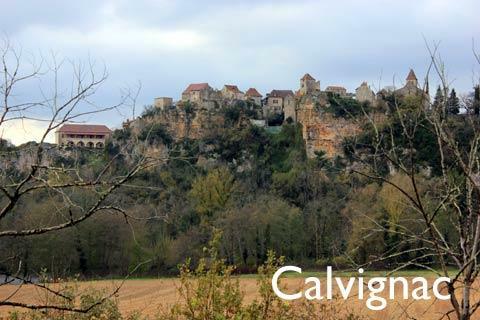 Further west we suggest you stop to visit the renaissance Chateau of Cénevières and the small village of Calvignac, yet another of the ancient picturesque villages strung along the cliff tops along the Lot valley. From the northern side of the river you soon glimpse a church on a hilltop. 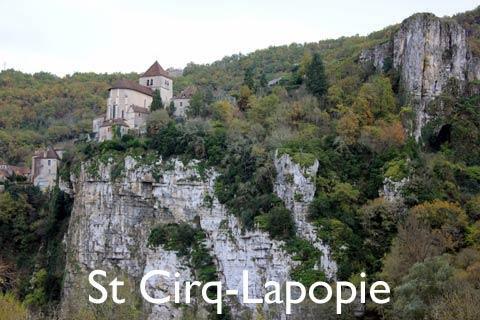 From here you can hardly guess that you are seeing the church of one of the 'most beautiful villages in France' at Saint-Cirq-Lapopie, an unmissable highlight of your trip. You can cross the river at Bouziés, a few kilometres to the west. 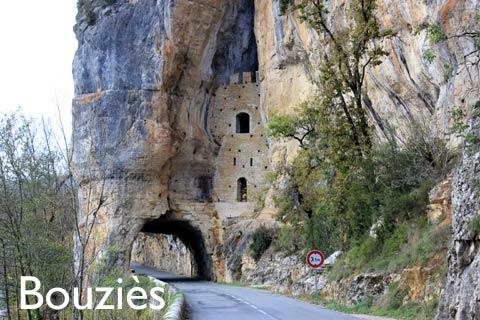 Bouzies is recognisable by its unusual fortified castle wall built right into the overhanging cliff. One of the most popular attractions along this section of the Lot valley is also at Bouziés - there is a tow path hacked into the cliff just above the water edge and it is possible to walk along this 'hidden' towpath in total tranquility to Saint-Cirq Lapopie. 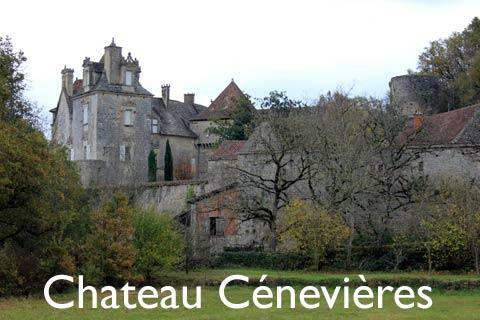 Another popular detour from Bouzies is to visit the caves at Pech Merle, a few kilometres to the north. These are unusual in featuring both a wide range of rock formations such as stalactites and stalacmites and also having some high quality prehistoric paintings and engravings. 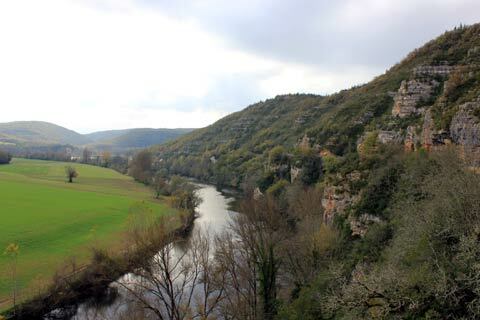 Returning to the river, between here and until you are within about 10 kilometres of Cahors the Lot Valley continues to be very scenic, the cliffs creating a picturesque backdrop to the small villages and woodlands along the river banks. After exploring, if you are returning to Figeac you should cross to the south of the river at Cajarc and follow the road along the southern edge of the Lot. It is on this road that you have perhaps the best scenic panorama over this section of the Lot valley at 'saut de la mounine'.